– Words you don’t want to hear from your airline pilot. – Most common reply from your Magic 8 Ball. At this point in time, both the positive and the negative of this new era in Kansas politics are surprisingly the same. So much remains unknown. Many of the key players remain unidentified. The new political zeitgeist is still forming. New alliances have yet to be built. 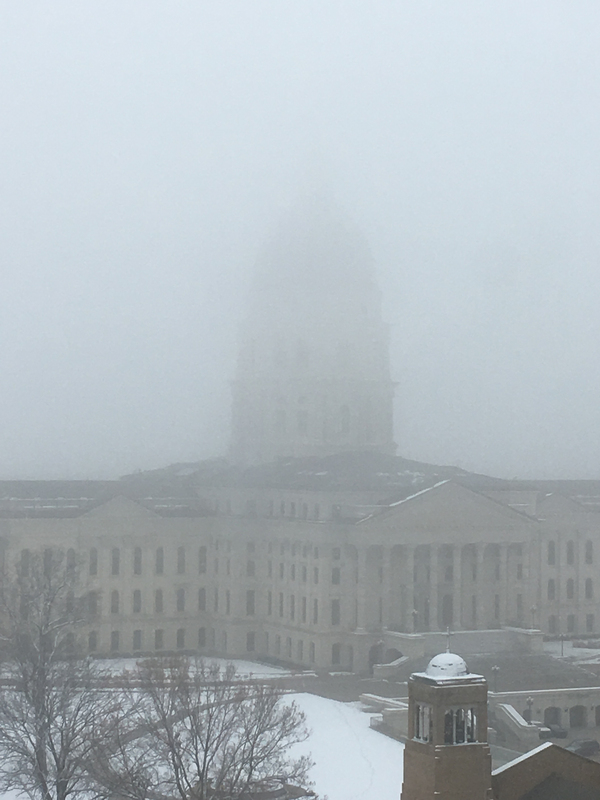 “The sky is truly the limit,” I thought as I gazed out at the fog encircling the Kansas Statehouse this week. A visual reminder of the uncertainty we face. However, unlike eight years ago when we were told by a new governor that “the sun was shining in Kansas,” we now have an administration that acknowledges the clouds that hang over state government. In her state of the state address, Governor Kelly this week pointed out the hard work that will need to be done in order to rebuild the state’s vital human service infrastructure. “We will make it right,” she said. I believe her. As advocates, we will need to be vocal in identifying the issues that face the Kansas I/DD service system. We will need to work to help this new administration be successful by being supportive when we agree as well as challenging when we don’t. They must be successful. The stakes are too high for them not to be. Comments on " When the Sky is the Limit"